We will learn how to make our Angular app available in different languages using i18n and localization. 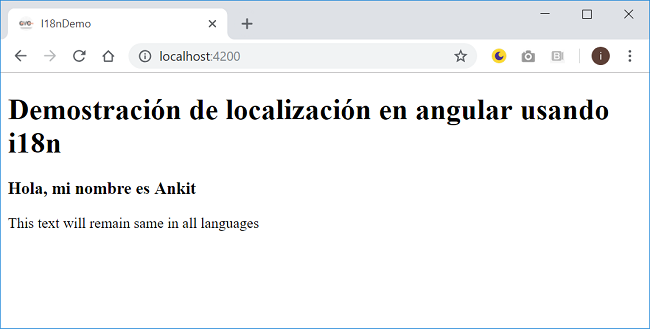 In this article, we will learn how to make our Angular app available in different languages using i18n and localization. We will create an Angular application and configure it to serve the content in three different languages. We will also deploy our app to Google Firebase and see how localization works in real time. We will use Angular 7 and VS Code to develop our application. Take a look at the application output. i18n, also known as internationalization, is the process of making our app support various languages to extend the reach to a worldwide audience. Localization is the process for translating the app to a particular language. We need to apply internationalization to the application and after that we can localize it. Localization allows us to serve our application in different languages. The first step is to create an Angular 7 app. If you are new to Angular, I would suggest you read my article Getting Started With Angular 7.0 to learn how to set up Angular development environment in your machine. Run the following command to create the app. Open the i18nDemo app using VS code. Open app.component.html file. Replace the already existing text with the following code. You can observe that we have marked <h1> and <h3> tags with i18n attribute. This is a way to tell Angular to consider this text as translatable content. We will explore i18n attribute in detail in the next section. Run the following command in the CLI to create a translation source file. It will create a folder called translate and create a messages.xlf file inside it. Open the file and you can observe the following XML code inside it. This file contains a list of <trans-unit> tags. These tags will have all the content that was marked for translation using i18n attribute. You can also observe that each <trans-unit> tags has an id property associated with it. This unique id will be generated by default for each tag that was marked with i18n attribute. We can also customize the id by providing a name prefixed with "@@" as we have done with <h3> tag in previous section. Hence, the id for <h3> tag is “myName” as we defined it. There is no entry for the <p> tag in translation file because we have not marked it with i18n attribute. Angular translation tool will not consider it for translations. If you change the text for any tag in your HTML file, you need to regenerate the translation file. Regenerating the file will override the default id of <trans-unit> tags. Hence, it is advisable to provide custom ids to each translatable tag to maintain consistency. Hence, we have successfully implemented i18n to our app. In the next section, we will extend it to make it available to different languages. We will translate our application into two new languages apart from English, which are Spanish and Hindi. Make three copies of the messages.xlf file and rename them to messages.en.xlf, messages.es.xlf and messages.hi.xlf. These file names can be customized as per your choice but the extension should be .xlf. Open messages.es.xlf and put in the following content in it. This is the same content as the original messages.xlf file, but we have added a <target> tag corresponding to each <source> tag. The <target> tag contains the translated text for the content inside the <source> tag. Here I am using Google translate for the translation but in real time applications, a language expert will translate the contents from messages.xlf file. Similarly open the messages.hi.xlf and put in the following content in it. Finally, we will make English translation file. Open messages.en.xlf and put in the following content in it. Open angular.json file and add the following configuration. Here we have added the configuration for Spanish language. We have provided the path and format for i18n file and set the locale to “es”. When we execute the application, app content will be served from the i18n file path provided. Similarly, you can add configuration for other languages. Once you have added the configuration for all the languages in angular.json file, run the following command to start the server. This will launch the application in “es” configuration and our app will show the Spanish language translations. The configurations that we have defined will only help the app to run in the local machine. We cannot change the configuration once the app is launched. A production app will need the application to serve for different language just by changing the URL. e.g. mywebsite.com/es will provide the Spanish version of site and mywebsite.com/en will provide the English version. In this case, the app will be served from different virtual directories for different language. We will explore how to do this in next section. Open app.component.ts and put in the following code. Here we have defined a list of languages and its locale code. These locale codes are standard codes. You can easily get list of language and the corresponding locale code by a simple Google search. Add the following codes in app.component.html file. Here we have defined three buttons for three languages. On each button click, the locale id will change and the locale id will be appended to URL also. This will allow us to serve the application from different directory. Put the following code in app.component.css file to apply styles to these buttons. Let us understand this command. We provided the locale id for package, which is “es” for Spanish. We also provide the i18n file path and format. The output path property is required to provide the location for application package. The baseHref property specifies the base URL from which this package will be served. We need to run this command for every language we will provide by changing the i18n file path and baseHref attribute values. However, this will be a cumbersome task if we have a lot of languages. Therefore, we will write a script to generate package for all language. Open package.json file and add the following scripts inside the “scripts” section. "build-locale": "npm run build-locale:en && npm run build-locale:es && npm run build-locale:hi"
We will deploy this application on Firebase to see the language change in real time. 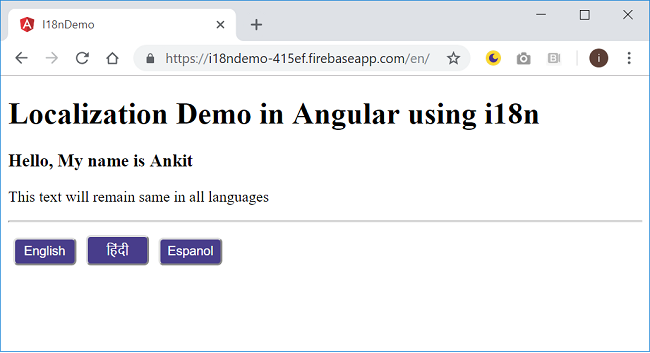 Refer to my article Hosting A Blazor Application on Firebase and follow the steps mentioned to deploy this Angular app on Firebase. Once the application is deployed, you will get the hosting URL. Open the URL and append the baseHref attribute as we defined earlier, to the URL. Hence, the URL will be yoursite.com/es/ for Spanish language and so on. Click on the links provided. The URL will change and the application will reload in a new language. We learned how to internationalize our Angular app using i18n tools. We also applied localization to Angular application. Localization allows us to serve our app in different language, which helps in extending the reach to a worldwide audience. We learned how localization works in a production environment by deploying our application on Firebase. Get the source code from GitHub and play around for a better understanding. You can also read my other articles on my blog here.